Evidence of anti-Irish attitudes in the upper echelons of the US media has shocked the Irish public as it struggles with a disaster in Berkeley, California, that this week claimed the lives of six students and injured a further seven. All of the fatalities were Irish, including one Irish-American. The students who were all on the J-1 summer work exchange programme died on Tuesday when the fourth floor balcony that they were on collapsed into the street. The balcony in question had been constructed of timber beams. The beams were rotten and had crumpled under the weight of students attending a 21st birthday party, sending them hurtling to their deaths. Incredibly, the New York Times used this horror as the basis for a stereotyped story of the Irish as drunken party-goers, and all but accused the students of damaging the apartment. Their description of the J-1 programme is completely at odds with the reality of Irish students working long hours for minimum wage to fill gaps in the US labour market over the summer season, and an important cultural link between Ireland and the US. It then went on to say that the students died at “what neighbors described as a loud party,” and even spoke to one neighbour who complained about the noise. It goes on to suggest that Irish exchange students drink constantly and have a habit of damaging property, linking the disaster to an isolated incident of student bad behaviour last year. The story appears to suggest that the students were partly responsible for their own deaths by standing together on the balcony. There was no attempt to report on the inherent structural weakness of the balcony, nor the evidence of dry rot witnessed by emergency workers and journalists who were present at the scene. Berkeley’s mayor, Tom Bates, has said investigators believe the wood was not sealed properly at the time of construction and was damaged by moisture as a result. Berkeley building inspectors also found another balcony at the Library Gardens apartment building to be “structurally unsafe” and “a collapse hazard”, and ordered it to be demolished. It has also emerged that Segue Construction, which built the building in 2007, paid $3 million (2.6m euro) to settle a legal action alleging water damage on balconies and windows at another complex. But the New York Times has a history of publishing pieces denouncing the Irish and the struggle against British rule. It has rarely mentioned British war crimes or the hundreds of murders carried out by “security forces” in collusion with loyalist paramilitaries. Clearly influenced by British-funded lobbying campaigns, those Irish Americans who support the Irish cause have typically been at the receiving end of the New York Times’s high-handed condemnations and willful ignorance of the situation in the Six Counties. But the approach to the Berkeley disaster appears to have once again exposed a vein of general anti-Irish prejudice which used to be a major force in American politics, particularly in New York. 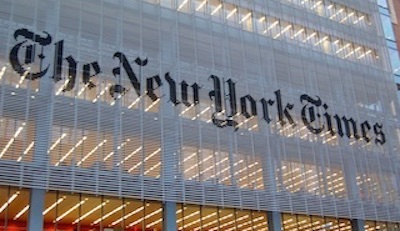 Tanaiste Joan Burton urged The New York Times to remove the articles which she said was both “a shame and shocking” in its treatment of Irish students. Former Irish President Mary McAleese said she found the article “utterly offensive” and described the six victims of the Berkeley balcony collapse as ‘young people who worked hard, studied hard’. “What bothers me most is the sheer absence of human empathy, the sense of sociopathic disassociation of the actual reality from the true story of these parents, the brokenness of these children’s bodies and the poor little children fighting for their lives,” she said.